This 22g tub comes in a plastic container with a twist lid that comes with an initial foil seal. 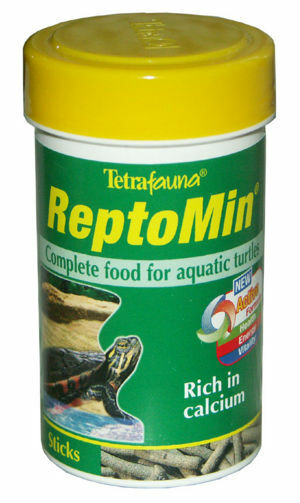 This product is sold as complete floating food for aquatic turtles. It consists of hard pale green sticks approximately 1.9cm (0.75") long that float and after a few minutes they become very soft and break apart. Until 2007 this food was also sold as suitable for Terrapins and amphibians such as Dwarf African Clawed Frogs. But the food is rarely taken by these frogs. Probably because the food floats, is mainly vegetables and the pellets lack any smell that frogs use to track down their food. The container should have a clear date stamp on the bottom and you need to check this. The food doesn't last forever, even if unopened, and you will want food that has at least 6 months of life still in it. All proper, high quality food should come in a sealed container of some kind as exposure to the air starts the decay process of any vitamins and protein. Never buy any that has the seal broken as they could be infected with bacteria or fungus. A typical commercial product will list all its ingredients, the order these are shown in indicate the largest amount of that food. Oils and fats - This provides smell and holds it together. This page was last edited on 24 February 2011, at 07:34.